Your path will lead you from the stables into gently rolling fields of hay, from there it winds it's way through a hole in the wall of trees and up into a forest of towering old oaks, maples, beech, pine, and cedar. As your path climbs through the forest keep your eyes peeled and wits about you - its not uncommon to see some of the wild residents of Glen Oro, such as deer, coyotes, rabbits, foxes, turkeys, and occasionally even the odd bear. Not to mention all of the smaller forest creatures! The sound of birdsong echoes through the trees, leading you up and up until you emerge into at an incredible vista. Our trail rides focus on creating a connection between you and your horse, emphasizing the incredible relationship between horse and rider as you move through the entire process of riding a horse - including the foundations of grooming, saddling, rider's safety orientation, and grazing after your ride. We aim to leave our guests at Glen Oro with not only a really cool experience, but also the knowledge of a skill that has been handed down over thousands of years. Doesn't everyone want to say they could ride off into the sunset, if they had to? 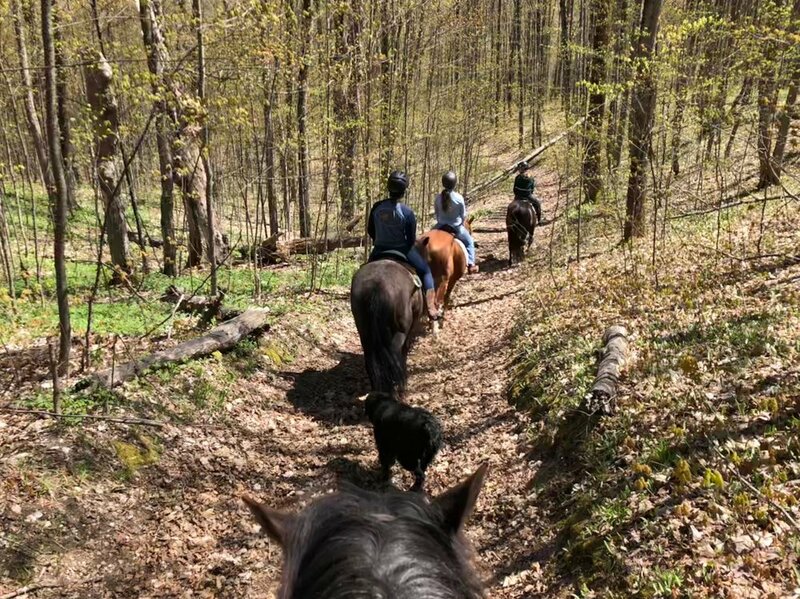 You must pre-book your Trail Ride to reserve a spot, Glen Oro is a working farm and that means our Guides have other duties when they're not leading your private group - so please, no walk-ins. Our trail rides are $99 per person with the HST included (Gratuities, however, are not included but always very appreciated if you enjoyed the job done by your Guide) - the rides are designed to be only small group, private and exclusive with no strangers joining you, just your trusty Guide. 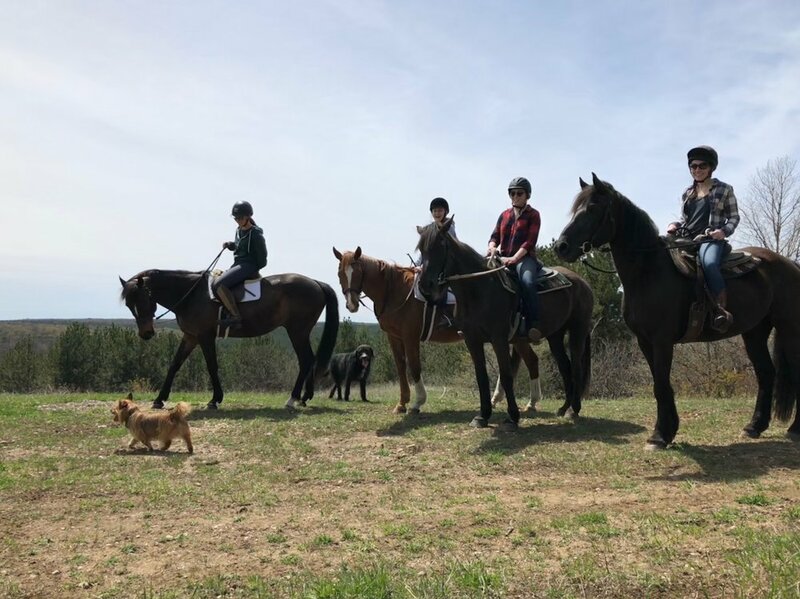 It’s a two-hour experience that includes horse handling and familiarization, grooming, a safety orientation and going over basic riding skills for your comfort and the horses, heading out onto the trails, and finishing up with grazing your new partner afterward the ride - with photos throughout. 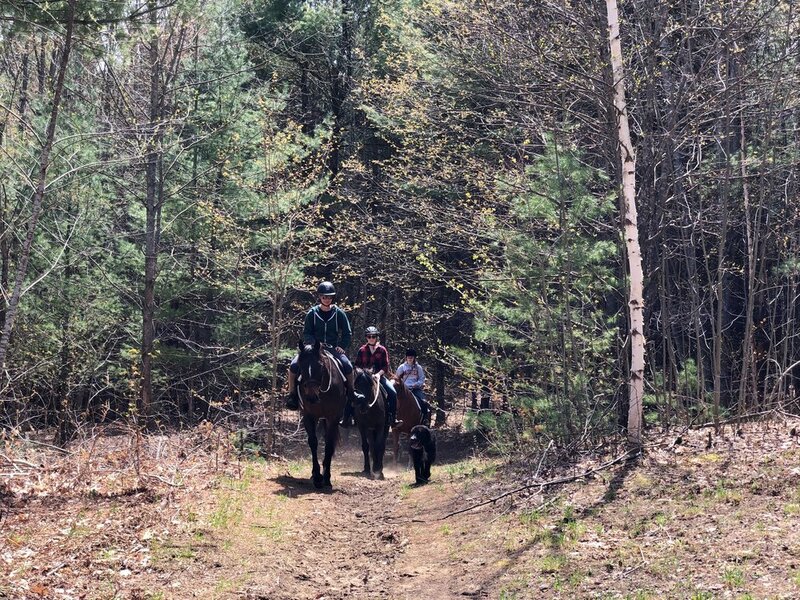 We really want to have our guests create a connection with their horse and its our responsibility to pass on some knowledge, so it’s a quick lesson for those in need of the basics and then a guided tour through some of the most beautiful terrain in Oro-Medonte. This is one of our biggest concerns for not only you as the rider, but also for the horses. Be honest with your skill level when speaking with your guide and they will assess your riding prior to heading out on the trails to make sure any problems that may arise out there are dealt with in a controlled environment. If the weather is too hot or too cold, it will be up to the Guide to make the call as to whether the ride needs to be rescheduled or shortened for the safety of your mount. We currently don't take any riders under the age of 12, and there is a weight restriction over 230lbs. Helmets will be provided and sized accordingly, riders should wear long pants to avoid chafing and wear close-toed shoes or boots that preferably have a heel so that they won't slip through the stirrups. We have a limited selection available to borrow in our Tack room at no extra charge, but no sandals and no shorts! This is for your safety and comfort. Thank you for inquiring about our Trail Ride experience, we will get back to you as soon as possible!